The epigraph(s?) of Gender City condenses what would be the otherwise unacknowledged or scattered cathectic charges of pavilions in a blank and anti-readerly moment as esoterically alarming as the discovery of age-weighted shelving practices, while utilizing the stylistic succor of regulative coolant (the wonderful Lisa Robertson) and aspirant fantasticality (New Zealand at Shanghai World Expo 2010). Spectrally efficient, these two quotes effect mutation and prove temporarily problematic: by brushing the bounds of a credible tele-cocoon with you, the writing soon coaxes out resentment for the rhetorical transposition in section one, that is, demoing a contrasting reader task, and projecting this actual loneliness backwards. This is not a question of inelegance, but a question, for me, of palling around with dissatisfaction beyond an intimacy that was never anything but that, a serif font that does the one like an I [“Homosocial fugue”], the first of nine content markers marking content that does not. And then all of this is a pleasure. Gender City is in the tradition of the long poem, and we corroborate this form with Lisa Samuels by gradually accumulating semantic awareness of what the space allows her to accomplish: varietal delight, acute description, architectures of anxiety. She is, broadly, and among other things, addressing the contemporary city (of refracted subjectivizing tradition) as its own contemporary: “Inside or insight / a t shirt with the realm of defamiliarisation / to itself.” (10). We are not working with certainty, but maybe peeking though a hundred tiny holes. Laura Riding, who Samuels has researched, writes (in Anarchism Is Not Enough): “Appearances do not deceive if there are enough of them.” Sometimes it seems that parts of the environment are talking, or superseding via future shapes or pronouns: “to hide behind trees until we’re trees [ … ] MY SKULL, SHE SAID / THIS TIME I FELT MYSELF / BECOME THAT BUILDING” (33). Already multi-stable in perception and efficiency, the lines are intercut by this quote’s capitalized formatting, a cue neither disagreeable nor affirmative, the same nor exotic, but possibly excessive or undeniable, and importantly non-exclusive. I associate a very flexible and dense mode of lyric poetry with Lisa Samuels, and here, as in other texts, I am surprised by the kinds of thoughts and images that can occur within a intricate vocabulary which nonetheless feels drawn from a unified, non-specialized discourse. There are many specifics that we might associate with something close to a recountable narrative throughout Gender City, such as character names and concrete locations (“The Barbie Doll museum”), but it would be difficult to establish these as the primary concern, instead of, for example, a codified means of thinking about socio-spatial dynamics through language that does not itself necessarily record that thought. 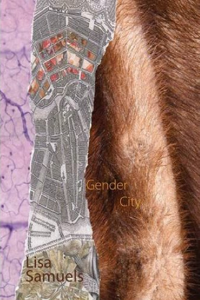 Per the book cover’s slightly grainy reproduction of Laura McLauchlan’s collage (‘Rat Coaxing’), a torn overhead city map aligned with a close photograph of a hairy limb: a small flying insect was just now trapped in the curls of my arm hair.